Sometimes, we need to edit a certain document file in a Word that comes from a PDF format. Of course, there's a lot of application features conversion — surely solves the problem. Now, what if you will just upload it via online and boom, you have the new Word document from a PDF file? Is it convenient? 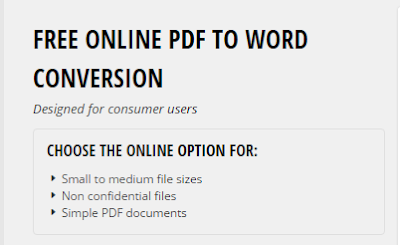 Just visit: http://www.investintech.com/ Accordingly, their ONLINE PDF to WORD service offers simple and fast way to convert PDF files to WORD docs. Yes. Kinda fast and easy way to convert PDF to WORD. If you want offline conversion, you can try their Desktop version - Able2Extract 9!